Welcome to the Los Banos Police Department’s webpage. As a life-long resident of Los Banos, I value the small town atmosphere of our close-knit community and I am excited about the thought of seeing Los Banos become a vibrant, larger city. I believe the Police Department’s role in our daily lives is to be professional, courteous, and respectful to all those we encounter. But, I also believe our role as law enforcement officers requires a strict adherence to the law and an uncompromising pursuit of those who desire to engage in criminal activity. I am proud to work with a group of dedicated, professional men and women who share the same vision: maintaining the safety and security of the Los Banos community. However, we recognize the Police Department alone cannot achieve this goal. Your involvement is crucial to our success. 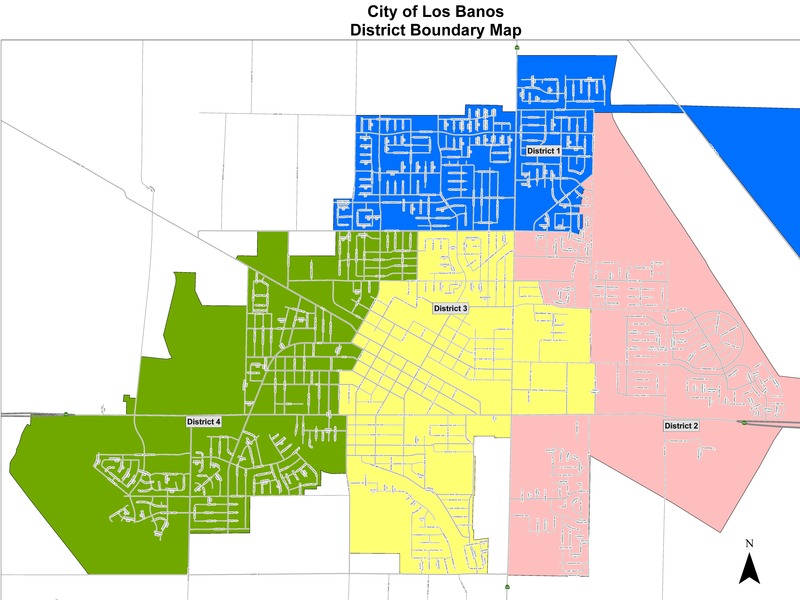 Your observations, descriptions and prompt reporting of suspicious or criminal activity to the Police Department will go a long way in keeping Los Banos safe. Thank you for visiting our website. If you are not able to find the answer on our web page, please send a message to me using my email address gary.brizzee@losbanos.org. We’ll do our best to assist you. The Los Banos Police Department’s (LBPD) Citizen’s Police Academy (CPA) is a 4-week program designed to provide our citizens and business community with a greater understanding of law enforcement and a behind the scenes in-depth look at LBPD’s organizational structure, functions and operational procedures. To provide Police Department employees with the opportunity to meet and hear from the citizens they serve. Participants are required to attend all nine sessions and are encouraged to actively engage in class discussions. Participants will be asked to critique the various instructors as well as the overall academy experience. There is no cost to participate in the Citizen’s Police Academy. All contacts (such as a speeding ticket or an arrest) with any law enforcement agency during the course of the class must be reported to the class coordinator as soon as possible. Any of the above requirements may be waived or modified upon review and approval of the Chief of Police. This incident occurred within the Los Banos City limits? There are no known suspects or leads? There is no need to speak with an officer or follow-up necessary? Are you interested in becoming a Police Volunteer? There are many fun and exciting volunteer opportunities available at the Los Banos Police Department. The Volunteer Application packet can be accessed by clicking here. The CLETS Disclosure Form can be accessed by clicking here. The VITAL group spends countless hours a year assisting the department. The volunteers help with DUI checkpoints and special events. The VITAL members also spend hours patrolling the city in volunteer vehicles. They know just how important an extra pair of eyes can be. While out on patrol the volunteers document road hazards, abandoned vehicles and graffiti. The Los Banos Volunteers for Animals helps at our Animal Shelter. Approximately14 Animal Control Volunteers open the shelter every Saturday from 12pm to 4pm for adoptions. The volunteers also work in conjunction with animal rescues to transfer dogs and cats that have not yet found a home. The Los Banos PAL is a non-profit (501(c)3) organization that provides programs and activities for our community. PAL first started in Los Banos in 1989 with five kids, one coach, one police officer, and a boxing program. Since inception approximately 15,000 kids and hundreds of volunteers and coaches have participated in PAL programs. 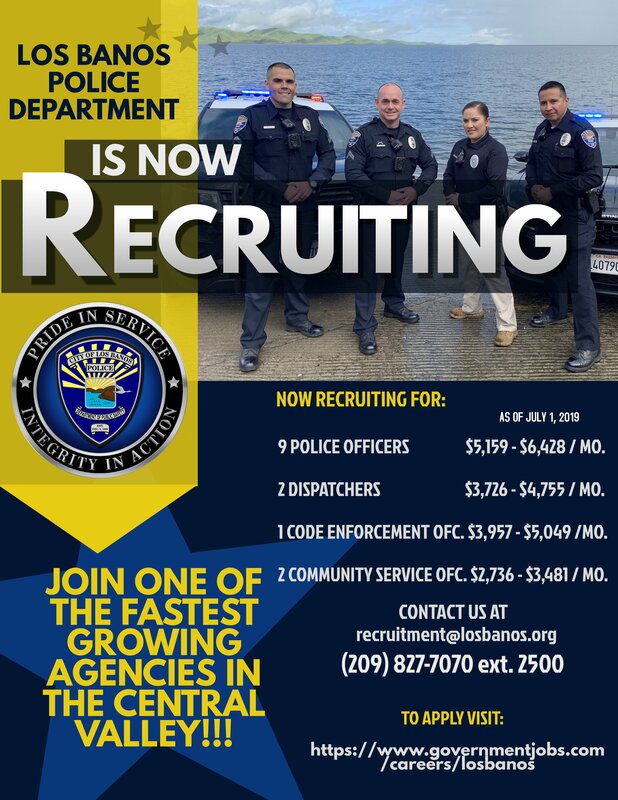 The Los Banos PAL has two objectives, the first is to provide quality, adult supervised programs that will foster a closer relationship between Law Enforcement Officers and the youth of Los Banos, encouraging a closer cooperation between the youth and the officers. This builds both understanding and respect. The second objective of PAL is to reduce youth crimes, violence, along with drug and alcohol use through positive interaction. Use the form below to submit anonymous information regarding locally abandoned vehicles. Please be sure to submit the exact description of the vehicle and where the abandoned vehicle is located. Use the form below to submit anonymous information regarding local graffiti, suspicious activities, or other related crimes. Please be sure to submit the exact location of the graffiti, and a description of the graffiti itself. The Department serves a community of 40,000 residents. There are 48 sworn police officers assigned to Patrol, Investigations, Traffic, School Resource, and Undercover Narcotics Investigations.